The financial press is not particularly good at forecasting market moves or giving reliable investment advice. In fact, it’s generally awful at both. (It’s a structural flaw; markets are forward looking, anticipating what will happen, while journalism is backward looking, explaining after the fact what already has happend). But if the financial press is truly good at anything, it would be coming up with pithy (yet meaningless) acronyms and abbreviations. First, we had the “BRIC,” which was shorthand for Brazil, Russia, India and China. These were supposed to be the four emerging market growth dynamos that would power the world economy for the next decade and beyond. Why not include, say, Mexico, Indonesia or Turkey? Mostly because the “BRICMIT” doesn’t sound as cool in marketing literature. Lest you think I’m joking, I am completely serious. 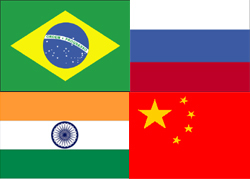 The only thing these four countries had in common when the term “BRIC” was coined was that their abbreviations made a word with a nice ring to it. (Of course, today they have disappointing rates of growth in common, but that is a topic best saved for another day. Next, we had the “PIIGS,” consisting of Portugal, Ireland, Italy, Greece and Spain. These were the European countries hardest hit by the 2008 meltdown and subsequent sovereign debt crisis. And now we have the “Grexit,” or Greek exit from the Eurozone. It’s difficult to handicap the odds on whether or when Greece might be kicked out of the Eurozone, but I would not at all be surprised to pick up a copy of tomorrow’s Wall Street Journal and find out that it happened overnight. Following on the heels of the Grexit is the “Squit,” courtesy of the Financial Times’ James Mackintosh. Squit, naturally, is short for “Spain quitting the euro.” Mr. Mackintosh might have been stretching a little on this one. If you are still reading this, shame on you. You really ought to make better use of your time. The best advice I can give you is to ignore stupid, trendy acronyms, or perhaps to use them as a contrarian indicator. Focus on the opportunities (or risks) that are not covered in a cheesy catchphrase. While Wall Street was busily rolling out BRIC ETFs and mutual funds for the investing masses, more nimble investors had already found more promising opportunities in the likes of Peru, Colombia, and Indonesia. The BRICs, thankfully, appear to be dead as an investment theme, and I suspect that by mid-summer most of the “PIIGS” hysteria will have passed as well. We may or may not have a “Grexit,” and I really couldn’t care less either way. None of really matters. A year from now, there will be some new trendy acronym that no one has thought of yet. Whatever it turns out to be, ignore it. Your time is better spent rolling up your sleeves and researching promising companies.